There is a running joke in Slovakia about the Czechs. Lots of Czechs come to the Tatras mountains each year. Of all visiting nations, the Czechs are apparently the most Gung-ho when it comes to forging off alone in the peaks without a guide (perhaps with the mentality that, if they speak 99% of the same language, Slovakia can’t possibly hurt them). Other nations are much more likely to plan a trip with a certain degree of caution. And of those who do get into difficulty in the mountains and need assistance from mountain rescue, the Czechs form the highest percentage. The Tatras claim several hundred lives from the tourists that visit them every year, in fact. Exposure, avalanches, falls down precipices and the like. To be honest, I think by nature I’m quite like those daredevil Czechs too. The Slovak mountains are so much higher and more dramatic then anything I’m used to in the UK. Thus the temptation is to run off into them, squealing with delight like a small child, and not think properly about the very real danger these mountains can pose to those who, like me, love trekking into the great outdoors. Hiking the Tatranská Magistrala taught me a few things about what you need to bring with you when you embark on an adventure in such mountains and so, Czechs and indeed adventurers from any land who might under-estimate the power of the mighty Tatras, this is for you: an essential kit list! 1: Warm, waterproof jacket OR better still, a waterproof jacket with a detachable fleece. That way, you can keep wearing the fleece in the mountain houses you’ll be staying at in the evening, which can still be quite cold inside. 2: Warm, woollen hat: temperatures even in June can get down to minus 5. 3: Gloves, but ideally not woollen ones. Ones with grip are better for hauling yourself up or down on those chains. 4: Hiking boots, well broken in. Do not attempt this hike without them. 5: Waterproof trousers. Pack these, and you can get away with just packing one pair of light trousers to wear underneath. You’re likely to get wet, at some point, and there’s often no cover in the Tatras. 6: Shorts are often better for summer hiking as it frees up your movement, but remember the definition of “summer” can be literally only July to September, so don’t come without a pair of long trousers too. 7: Sunglasses: great to cut out the glare. 8: A dry change of clothes for the evening: you’ll appreciate them no end. 9: If you suffer from any kind of problem in your legs, a knee support: some of the downhill sections are jarring on the bones. 1: Rucksack with waterproof covering. Self-explanatory, right? 2: Walking poles: not essential, but you are going to feel the benefit on the often punishing ups and downs. 3: Torch: a head torch would be perfect as it keeps your hands free, or a maglite that’s light but powerful and can help if you’re caught on the trail after dark or can’t find the light switch in the night. 4: Whistle and, ideally, a flare. This sounds over the top but it isn’t: you could easily get into difficulty and phone reception could be non-existent. This could be your only way of getting help. 5: Mobile phone and charger: for similar reasons to the above. Make sure you at least have a phone that will function if the reception comes. 6: A good map: Again, it sounds obvious but you’d be surprised. 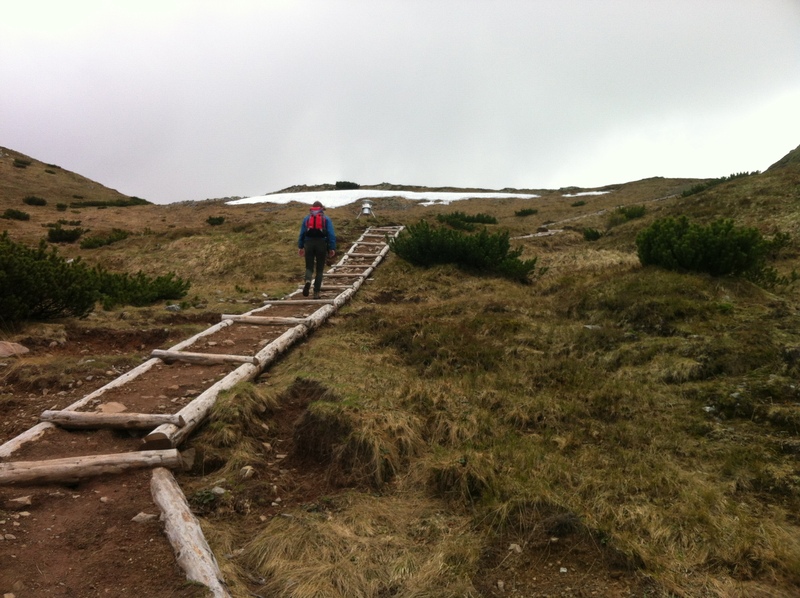 See our guide here to buying hiking maps in Slovakia. 7: A compass: Pretty important, especially on some of the less well-signed trails. 8: Book/ pack of cards: for evening entertainment. 9: Cash. Don’t bank on being able to pay by card. 10: Camera: you’re going to get some great pics. 11: Sharp knife. It’s going to come in useful. 12: Lighter. Probably good. At the mountain houses it’s possible to have a camp fire. 1: A good supply of water. At least a 1.5 litre bottle (this should be enough to get you between one mountain house and the next, where you can fill up). 2: Sugar fixes: for morale boosts and energy. Whatever you like. 3: A hip flask filled with something strong. That’s the way the Slovaks do it! Got the general idea? Now it’s time to go to our Tatranská Magistrala Stage Descriptions and our recommended High Tatras Mountain Houses (under the Places to Stay/High Tatras sub-section) which of course tie in with the Stage Descriptions.